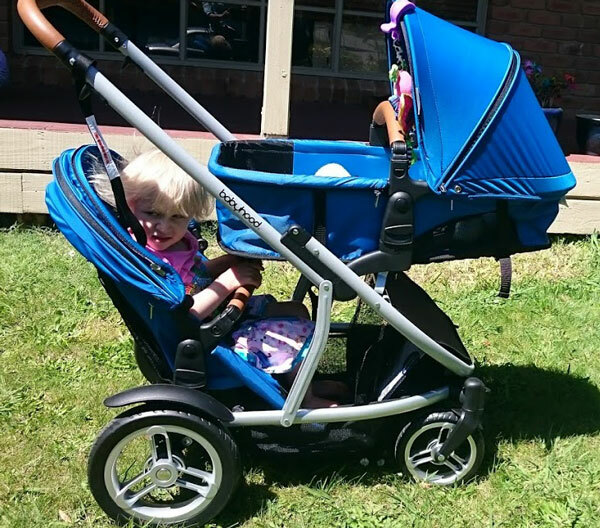 When I saw the babyhood Doppio at the Pregnancy, Babies and Children’s Expo a few months ago I was SO impressed with this pram that I just had to get my hands on it to review. I had a little play with it at the expo, but I really felt like it deserved a thorough review. So I got in touch with babyhood and they’ve generously sent me out this amazing pram to show you all! The babyhood Doppio has so many awesome features. I’m so excited to introduce it to you! I’m unreasonably excited about this basket. I’ve had similar prams in the past and when you put the second child in the back their feet go into the basket. I’ve had many loaves of bread destroyed because of this fact. BUT the babyhood Doppio has a second pocket, accessible through a magnetic flap at the front, and separated with a mesh bag that will keep your more fragile items safe from little feet. Also each compartment has it’s own weight limit – 5kgs in the main part and 3kgs in the front! babyhood Doppio is a great pram for serious shoppers. I loaded the babyhood Doppio up with a friend’s two and four year olds. Even fully loaded we were able to push across grass, up and down a step, and steered quite comfortably one handed – with a tight turning circle. Which is really impressive for an inline tandem, especially when we put the older child in the front seat as this is when some prams can feel too heavy to steer. So I’m very happy with that. The way the babyhood Doppio folds down is so effortless – and it pops back up just as easily. While technically you can fold it with the top seat still attached it’s much more compact when you remove both of the seats. Folded it fits easily into my standard sedan sized boot with plenty of room left for shopping and gear. There are A LOT of different configurations you can try based on the age and size of your children. There are up to 16 different configurations! 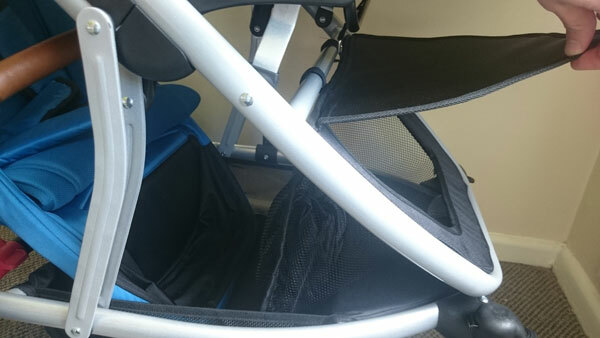 Including the option of having a car seat capsules in both seats making it a complete travel system for twins! For two newborns having the front seat parent facing and the back seat forward facing means you can actually see both babies at the same time and they’re both really accessible for getting in and out. For deciding who sits where between a newborn and a toddler I think it depends on which child is in the pram for the most time. If your toddler prefers to walk, but they just need the option of a seat then I would put the bassinet on the front, and the toddler seat at the back. Your toddler will not have a lot of room to look around, but they will be able to rest their feet. If you’re going to be doing a lot of walking with the toddler in the pram, then pop them in the top seat – either rear or forward facing depending on their preference – and baby in the back seat. This way you can also see and chat to both of them at the same time. With two toddlers I think you’ll mostly have both toddlers facing forward. In this position both toddlers can be sitting up, or lying flat. 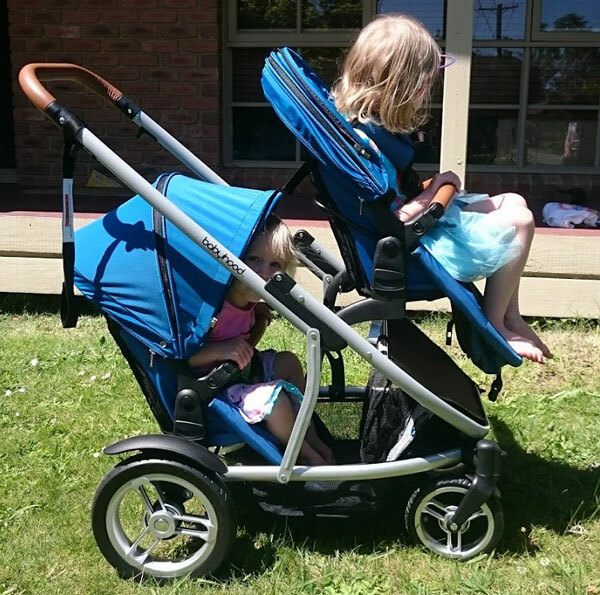 One reason I would put the toddler on the back in the parent facing position – other than if they just want to be able to see you – is this position opens up the space in the basket underneath. If you need to do some serious shopping then this is a fantastic position. This configuration wouldn’t be ideal for babies as both seats can only do a half recline in this position, but is perfect with two toddlers. It has a very generous hood with a zip-open mesh panel for ventilation. The hood is made of a stretchy fabric which means it can be extended without having to zip open the mesh panel. Zip on/off fly mesh that fits neatly over the opening of the seat. Stitched leatherette feature on the handle and the bumper bars on both seats is a really nice touch. Large rear wheels for a smooth ride. Accessories can be purchased separately : car seat adapters, cup holder, or stroller caddie. Come in either teal or black, with a steal or black frame. When you have the back seat in bassinet mode the brake is really tricky to access. It’s possible, but you have to slip your foot around the side of the bassinet to reach the brake. Also the handle isn’t adjustable, but it’s a good height for me and I’m 164cm tall. Love that the seat turns into bassinet!! What a great-looking pram – and quite ingenious! What a great pram to take out – be it up the road for a coffee or for a trip around the world! An amazing pram, from birth to their first steps! Looks like an amazing, versatile pram. Steph Small check this out i would love one for the future! Awesom and s functional. Been 4 years since our second baby, unexpectedly expecting third one now. This would make a great Xmas gift for us. Love it, so versatile and easy to use, ideal for everyone to use and enjoy! Wow, what a brilliant pram! Way more configurations than I’ve ever seen on another pram! This pram would make going out with my twins a lot easier! what a fantastic pram, stylish and such great features! Awesome Pram. I’d Love to gift this to a mum I know who’s doing it tough if I win. I love that you don’t need to purchase a separate bassinet seat for the first few months. This seems so much smarter and more versatile! This would be amazing for our little guy! And perfect for when we decide he needs a brother or sister ? Would love to win this ? This would be perfect for our little man! Might even help convince the hubby to have baby number two next year!!! ? I would love this! Thanks for the opportunity! This looks fantastic! I have 3 boys and planning 1 more bundle ? it would be sure to get a workout in our household. This pram might just convince me that it’s worth having a second baby!! (First is 3 months old, so still in shock lol!) This pram looks way better than my current one! Wow it’s pure perfection for a busy mum! This pram is genius! I love the different combos! Looks amazing! And so much lighter and easier to put down than mine! What a thorough review. I’d put this pram to good use. How gorgeous, my boys would love this ?? What a great pram. I hadn’t hear about this one till now. It looks amazing. 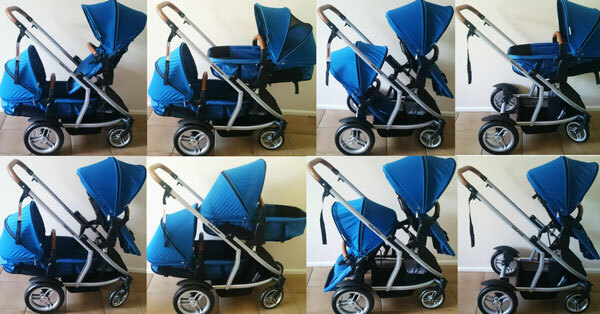 I would love to win this gorgeous pram for my Mum! The Grandma who never complains when asked if she’ll look after her grandchildren, the Grandma who gives up her own life to care for her daughter when was diagnosed with Breast cancer with two small children. (that is me!) The Grandma who fills our fridges weekly, the lovely Grandma who surprising us with clean bathrooms, the Grandma who has the best tickles and stories. I could go on all day. I am so lucky to have the most amazing helpful Mother. 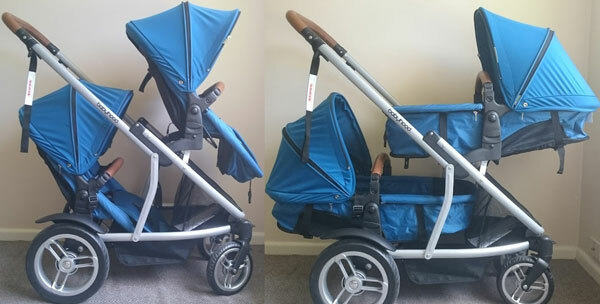 This Babyhood Doppio Pram not only looks great but it light enough for Mum to lift into the car when she’s looking after the two small ones. This is an amazing giveaway! I would be thrilled to win, then i would be so organised (plus super stylish) for my new arrival, due 2017. Could come in handy next year!! Love this pram so much room for both kids and super stylish. The seats that convert into bassinets are brilliant. With my sister’s pram the bassinet was an (expensive) added extra that could only be used for a short time before needing to be stored somewhere. This is a much smarter design. I love that it is so versatile. There are so many options depending on the age and mood of your kids. 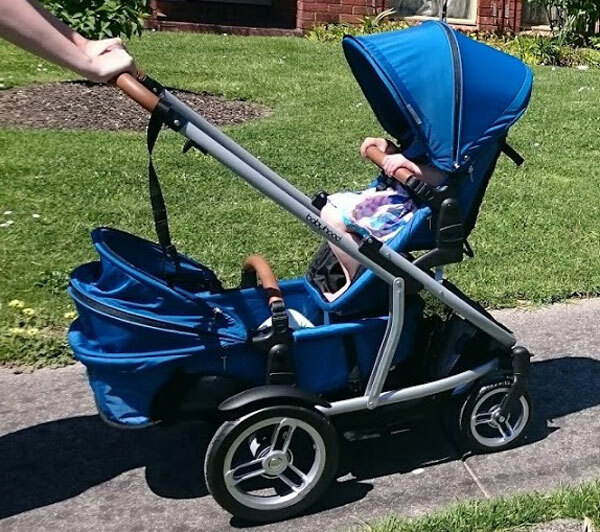 What an innovative and handy pram! 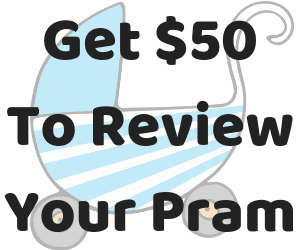 I’m looking for a new pram! We bought our first one second hand and it was just a bit too wide (so embarrassing at cafes I feel like a bull in a china shop!) This looks like it would be a little smaller but also great that it would accommodate baby number 2! Ohhhh wow.. thank you for the chance ? 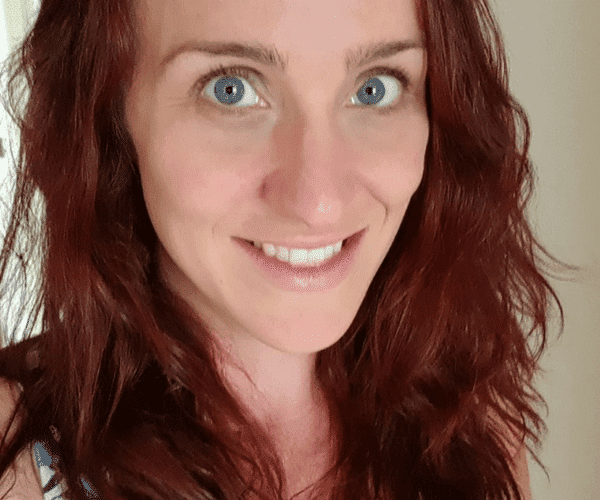 As a mum of five little ones (8 and under) I love the versatility of the seats and configurations and I especially appreciate the compact fold, a real must for our family car! What a great pram.Love all the configurations and the ease of the seat turning to a bassinet.Is love to win for my two little men in my life . This would be perfect for our twins due in January! I need this! Pram looks awesome and I love the bright blue ??? Love your review ! Perfect Inline Pram ! Looks like the perfect pram! It’s a girl but I’ll take blue. Seats that turn into bassinets! Why wasn’t that invented yet? But the doppio makes it as easy as packing in fruit. Like Dr Seuss with I Am Sam. I love how it folds to fit into the car boot. Looks great and so compact too! Can’t believe all the features of this pram. Looks great!! Looks so light and stylish! Love the convertable seats and the fact it has a split basket! This looks perfect!! Love it. This looks great! It would really match my fitness attire, and the hood protects little bubs from all that UV! I would absolutely love to win this pram. My current pram is heavy and a struggle. With a newborn and a 14 month old this pram would be great! 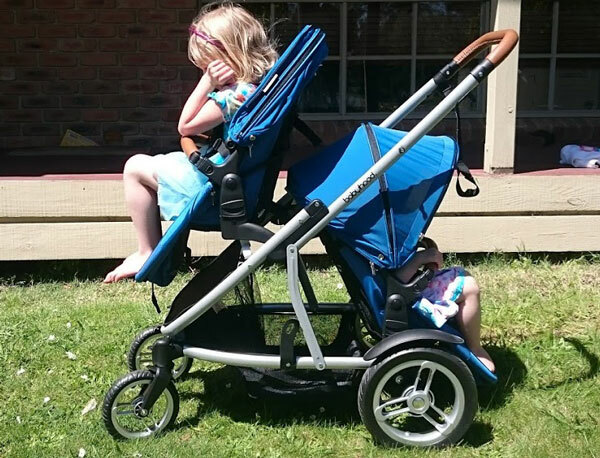 This pram might be the solution for toddlers who don’t normally like the bottom seat! I have nothing lol.. i got rid of it all 5 months ago. A perfect start in life that a baby can have. Looks really great. I have three kids three and under who all love having a turn in the pram! So different configurations could be very helpful ? 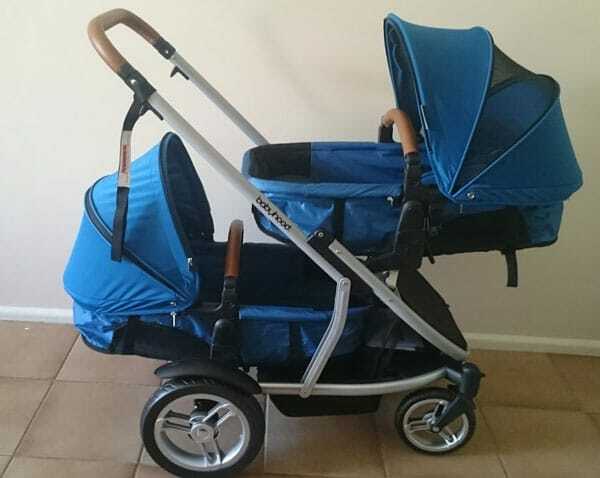 Parenting Central: How do you find this pram as a double with regards to stepping into the pram? Do you end up kicking the seat or can you still take long strides? It’s a shame the handle bar isn’t telescopic to address this. I agree, I love a telescopic handle. I was fine with walking with it without kicking the seat and I’m 163cms tall – so I’m pretty average height. I think that a taller parent might need to be aware of their stride though, especially if there is a bassinet at the back or the seat is reclined. I hope that helps. Thank you for the reply. I’m 171cm and hubby about 180 so might be an issue but still keen to try. Ticks lots of boxes but i do like walking far so needs to be functional. Any chance you know who stocks these in Melbourne?. All my Google searches are coming up empty.